Does Swimming Help Lower Back Pain? If you struggle with back pain, you are not alone. In the United States, more than 80 percent of adults have had lower back pain at some point in their life. That’s a staggering number of people who have had to struggle with this condition. Although many people take over-the-counter pain medication to help deal with this painful symptom, that’s not the only solution. Many are turning to activities like swimming to relieve back pain. But does it really work? Studies show that aquatic exercises, including swimming, are indeed some of the most useful activities to relieve lower back pain. When a patient struggles with lower back pain, the temptation may be to rest and avoid exercise altogether. However, that’s one of the worst things you can do. Too much rest can cause the muscles that support the lower back to atrophy. When these muscles weaken, they cannot stabilize the spine properly, which causes the patient’s condition to worsen. For that reason, experts agree that performing strengthening exercises for these muscles is essential for spinal health. Exercises performed on land put a lot of strain on the spine. 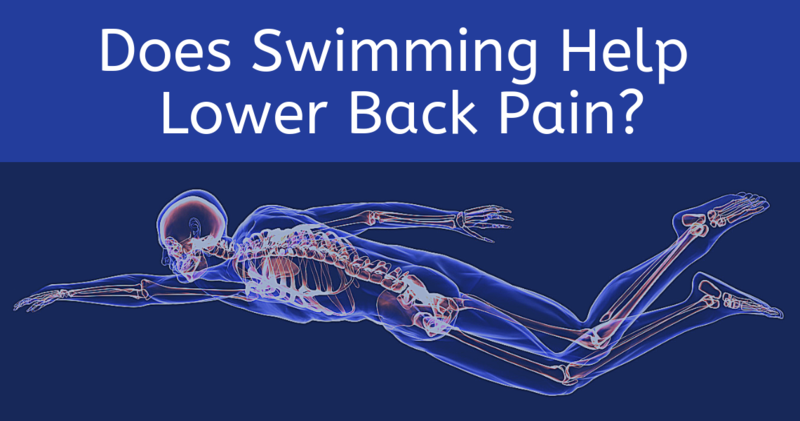 Activities in the water, like swimming, however, allow patients with lower back pain to strengthen the muscles that support the spine without the stress. The buoyancy of the water takes the pressure off the spine and joints. Relaxes Your Nervous System: Tense muscles are sometimes what causes back pain to develop, or they can aggravate spinal conditions which can cause increased pain. Swimming releases endorphins, the feel-good hormones, which relax your nervous system as well as tense muscles. Relieves Pressure on Joints: When you swim, up to 90 percent of your body is buoyant, so it is supported by the water. This puts much less pressure on your joints than other forms of exercise. Builds Muscle to Support Spine: Exercising in water supports your joints and spine, and it also increases resistance by 12 to 14 percent. Swimming engages muscles that you don’t always use, particularly those needed to improve your spine’s stability. Walking: Although technically not swimming, walking around the pool still allows you to reap benefits for your back pain. The resistance builds up your muscles, especially if you swing your arms while walking. Water Aerobics: Aerobics in the water is perfect for working on the cardio aspect needed to build muscle strength. It works a variety of muscles while at the same time building your flexibility. Swimming Laps: If you’re not a swimmer, it’s important to start slow when swimming laps, perhaps only twice a week at first. All the different types of strokes work a variety of muscles in your hips, chest and back. And you can always begin with treading water if you’re not comfortable with any particular stroke. Swim coaches can give you tips on the proper technique, so you don’t hurt your back through improper form. At International Spine Institute, our primary objective is to get you the treatment you need to help manage and alleviate your back pain. If swimming and other home treatments aren’t relieving your lower back pain, then contact us today for more information about our least invasive spine procedures.